In 1950, long before Star Trek sought out the final frontier, a truly British comic book hero promised a brave new world. Dan Dare: Pilot of the Future was the original guardian of the galaxy. The brainchild of Rev. Marcus Morris and under the creative stewardship of Frank Hampson, Dare’s weekly battle against one of the most memorable sci-fi villains of all time – the Mekon – was full of daring and wondrous space adventure. His adventures were the perfect antidote to post-war austerity and a nation’s fear of what the future held. My introduction to Dan Dare came much later via my father. Alongside my weekly fix of Mike Butterworth and Don Lawrence’s equally imaginative The Trigan Empire, I was soon hooked on the exploits of this most intrepid and ever so British space hero. In no small part Dan Dare ignited my fascination with mankind’s quest to journey beyond our blue planet and explore strange new alien worlds. 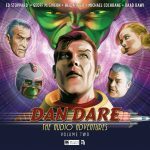 With film and television drama now seemingly dominated by American comic book heroes, Dan Dare has always stood out as being unashamedly British — a bright light of daring optimism that captured the hearts and imagination of a generation. To be honest I’d always been rather disappointed by Dare’s audio treatment in the past and in our all-new adventures, inspired by the original Eagle comic-strips, we set out to not only introduce him to a new audience, but also capture something of the classic Saturday adventure serials of the 1940s which so clearly inspired Dare’s creation. 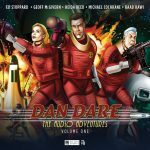 There have of course been many attempts to update Dan Dare, but for my money audio is unquestionably the perfect home to deliver truly epic Dan Dare adventures that are the embodiment of its comic book inspiration. We hope you’ll enjoy your journey with Dan Dare as much as we enjoyed making it.